Heather O'Neill's distinctive style and voice fill these charming, sometimes dark, always beguiling stories. From “The Robot Baby,” in which we discover what happens when a robot feels emotion for the very first time, to “Heaven," about a grandfather who died for a few minutes when he was nine and visited the pearly gates, to "The Little Wolf-Boy of Northern Quebec," in which untamed children run wild through the streets of Paris, to “Dolls,” in which a little girl's forgotten dolls tell their own stories of woe and neglect, we are immersed in utterly unique worlds. Also included in the collection is "The End of Pinky," which has been made into short film by the NFB. With this collection, Heather O'Neill showcases her diversity and skill as a writer and draws us in with each page. Daydreams of Angels is a little piece of magic. It brought me back to the same feelings I had in my childhood while reading Alice in Wonderland or The Wizard of Oz. These books immersed me in a world of wonders, which left me fascinated but also slightly scared… after all, Alice almost drowns in her tears and a walking scarecrow wasn’t my vision of a best friend! Daydreams of Angels possesses this ambivalence too. It’s beautifully written and immerses the reader into its oneiric worlds with no effort. However it’s also heartbreaking and very often tragic. While giving life to angels and talking bears and abandoned dolls and half-mechanical people, it also tells extremely thought-provoking stories about real-life childhood and family legacy. It was because of his childhood that he couldn’t trust anybody. A few themes tie all twenty six stories of Daydreams of Angels together. My favourite one was the consequences of a child’s environment and family over his or her future. Several characters in the book—often little girls—are abused or neglected. Sometimes they live in extreme poverty. Always, they were born with a good heart but their surrounding—social pressure, mean adults or families—eventually define who they become. He didn’t believe in biological families. He thought that the root of capitalism was that when we were born, our parents owned us. And he said that biological families had a knack of teaching people to band together and hate outsiders, which was essentially just getting them prepared to wage war against others. However, Heather O’Neill shows how nurture and a child’s future are tied in a peculiar way, not always giving the expected result. In the incredible story “Swan Lake for Beginners”—one of my favourites in the book—a (slightly mad) scientist is trying to clone the famous dancer Rudolf Nureyev. While they manage to give birth to batch after batch of clones, the team is confronted with an odd issue: most clones don’t want to dance, most of them—when forced to—hate dancing, and the ones who eventually dance are nowhere as good as the original Nureyev. The story shows that Nureyev’s relation to dancing was much more than the result of an adequate physiology. Dancing was a way to express and affirm himself, and even survive in a harsh environment. You were defined by being loved. Love exposed you to loneliness. Love gave you a personality but damaged you, too. Yet, not all stories are (entirely) tragic. Other shows the power of a single person to make a child’s life brighter. “The Man Without A Heart”—another favourite of mine—shows how a single man, damaged and prejudiced against, can make a difference in a child’s future. “Bartok for Children”, a modern Pinocchio story, also shows how a man can instil affection and a family sense into a seemingly heartless boy. There would be a lot more to say about Daydreams of Angels but instead of going on forever about it, I thought you might as well pick up the book and enjoy it first hand. It feels like reading a mix of dreams and childhood recollections. Heather O’Neill’s style is simple, vivid and fluid, immersing the reader with great ease in magic and sometimes sinister worlds. 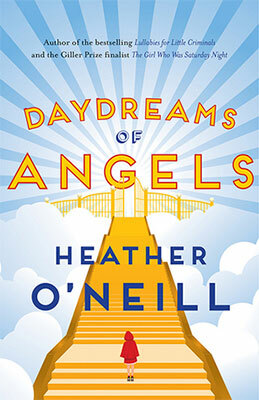 Let’s wish Daydreams of Angels the best of luck for the Giller Prize 2015 and in any case: read it. Just read it. I wasn’t sure if I would be reading this one, but you make it sound so good. I’ve seen other praise of it recently, too. I’m still hoping to read her first book sometime soon. This might be a good read-a-story-a-night book. I haven’t read Heather O’Neill’s previous books either and I really want to as well! I’m glad if I made you curious about this book and hope you’ll enjoy it as much as I did. I don’t you think you’ll be disappointed!